Posted on Wed, May 4, 2011 : 8:21 a.m. This is a great Mexican/Southwest inspired recipe to warm up your palate for Cinco de Mayo festivities. Tortillas are often one of the first items that people think of when referring to Mexican food. These flat round cakes are the canvas one uses to make burritos, chimichangas, enchiladas, flautas, quesadillas, tapa, flauta and tacos. Tonight's recipe is for easy quesadillas, which I loosely interpret to mean flour tortillas filled with cheese, a few more tidbits according to whim, folded then fried until crispy. Chicken, beans, hot peppers, artichoke hearts, eggplant, tomato and pumpkin seeds would all be great substitutes for the red pepper and spinach, as well. *Peppers are easy to roast, as you can observe on this video, but you can also purchase them roasted and bottled at most local grocery stores. 1. Trim pepper halves to lie flat. 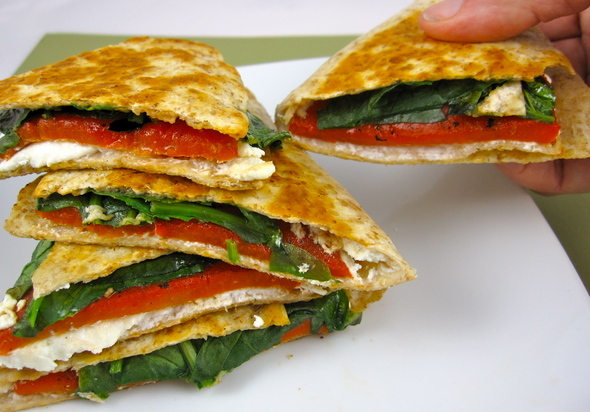 Spread 2 ounces goat cheese on each tortilla and top with red pepper half and spinach. Fold each tortilla in half. 2. Coat a large frying pan or griddle with canola or vegetable oil; heat oil to medium heat. Fry tortillas, in batches, pressing lightly with a spatula. When one side is golden brown, about 1-2 minutes, carefully turn over with a spatula or tongs and cook other side until golden brown. Serve whole or cut into wedges. Looking for a specific recipe? Click here for dinnerFeed's recipe search engine; type the recipe or ingredient into the search box. I am a real-time food writer and photographer posting daily feeds on my website and in the Food & Drink section of Annarbor.com. You may also e-mail me at peggy@dinnerfeed.com. Tue, Apr 2, 2013 : 3:37 p.m. Nothing is said about goat cheese in the list of ingredients. Could goat cheese in the form of a goat cheese log be used? It's the only way I've bought goat cheese so far. Never crumbled goat cheese. You say, &quot;Spread 1/4 goat cheese on each tortilla...&quot; One-quarter of how much? Does it matter if it's from a log or if it's crumbled or solid? Thu, Apr 4, 2013 : 4:56 p.m.
Fri, May 6, 2011 : 1:29 p.m. Wed, May 4, 2011 : 6:44 p.m.
Love the inventive quesadilla filling, Peggy! Gorgeous picture, as usual! Wed, May 4, 2011 : 5:54 p.m. Thanks Peggy! I totally see it now. I guess when I make quesadillas I stack 2 of them with the filling in between so it didn't occur to me to fold one. I feel so stupid ;-) Again, these look amazing! Wed, May 4, 2011 : 5:41 p.m. Wed, May 4, 2011 : 4:38 p.m.
Peggy, these look and sound delicious! I have one question though. In the picture it looks more like pita was used since the edges appear to be sealed. Can you explain what I'm looking at and why it doesn't look like a tortilla?